Now, let’s get going. Now, I do have these issues, but I have a free trial of Marvel Unlimited this month, so, guess what? You get to have better quality than my crappy scans! 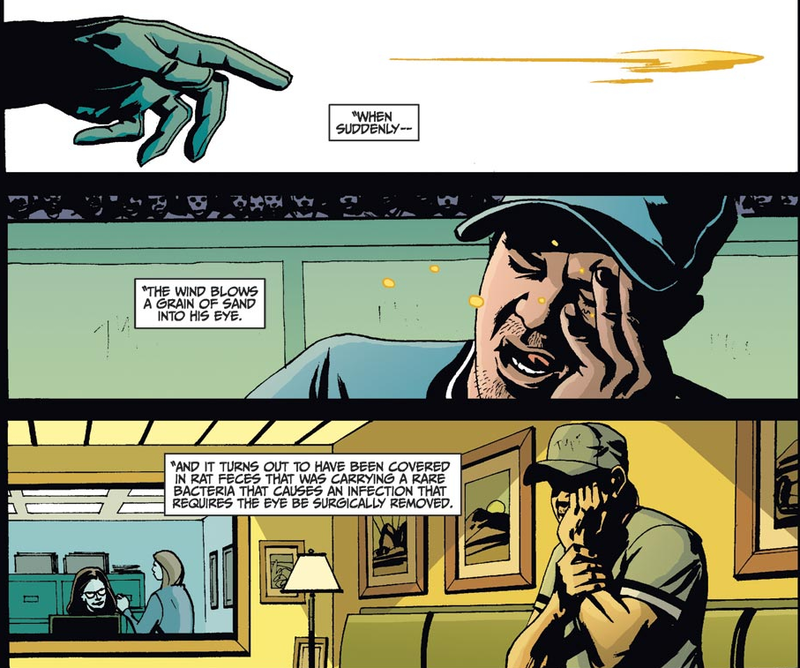 Charlie Huston, the writer of this miniseries, is a crime and horror novelist but who’s occasional dips into comic books include runs on Moon Knight and a Wolverine mini-series. Shawn Martinbrough, who did the pencils and inks, has worked for both major comic book publishers, as well as for independent publishers. Colorist Lee Loughridge has done a ton of stuff everywhere, most notably Fables and various Batman comics. Letterer Jeff Eckleberry has mainly worked on Marvel books, such as a recent Rocket Raccoon book. The cover was done by Tim Bradstreet, an artist who, in addition to comic covers, has done some movie posters as well. “He,” of course, is Bullseye. 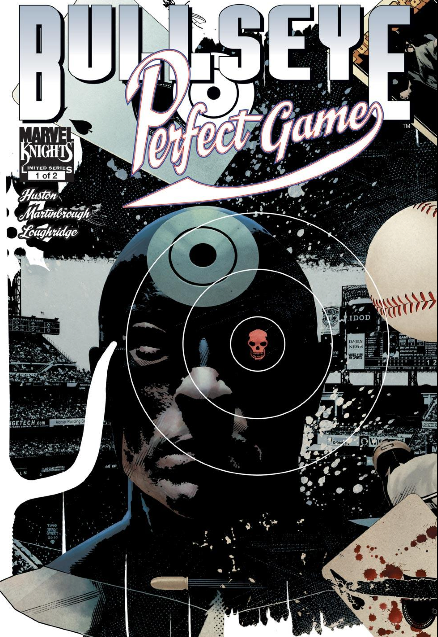 And if the fact you are reading a story titled Bullseye: Perfect Game doesn’t make it obvious enough, the collector proves it to you in the coming pages as he discusses why people had no idea where he was. 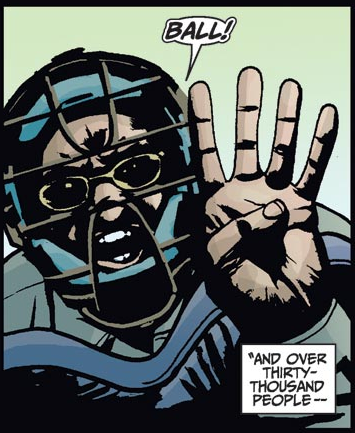 The collector says that assassins like Bullseye have fans who pour over accounts and keep track of everything. Sound familiar? It should. 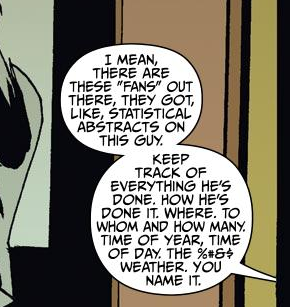 Basically, the assassins of the Marvel Universe have sabermetrics attached to them. 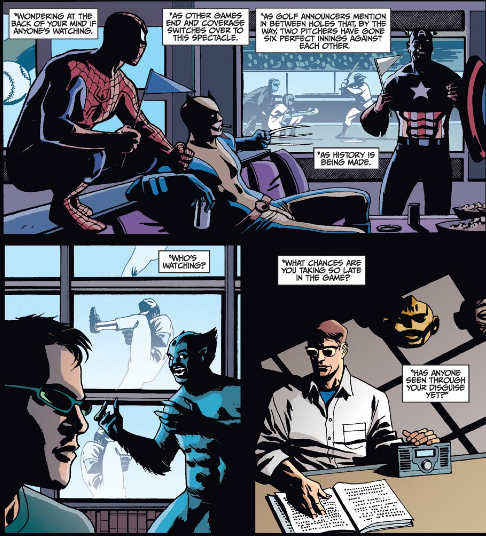 And, the collector explains, some people play games and make money on them, betting on who might assassinate someone, or whether they might appear somewhere. Yes, in the Marvel Universe, they play Fantasy Assassins. And the most money rides on when the target is a superhero. So, needless to say, people most definitely keep track of this type of thing. Yes, according to the collector, Bullseye is bored. He wants to not merely kill, he wants to do it in the most amazing ways. 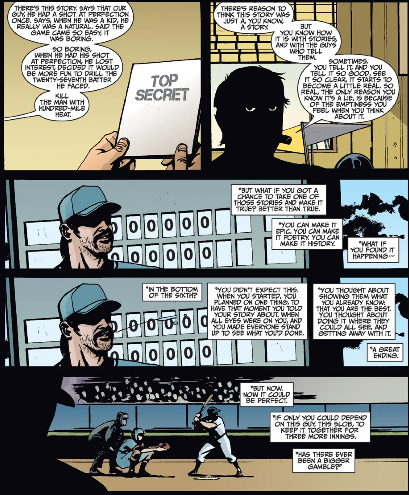 The newspapers that the collector shows indicate what Bullseye is aiming for: he wants to do the assassin version of stealing home during the World Series like Jackie Robinson, or become the Hank Aaron of Assassins. Yes, Bullseye once hit one of the ultimate highs of his profession. Comic book fans will recognize what that high was in the picture above, but rest assured, it was definitely the most notable thing that Bullseye ever did. And, obviously, Bullseye has set a high standard since then. He wants something new every time, something unique. How unique? Well, we then get a scene where Bullseye gets calls from his agent offering him contracts to take out a oil sheik, a slug-alien, a dirty congressman, a cheating-husband millionaire, a supervillain’s nemesis and even the President of the United States. Bullseye passes them all up. 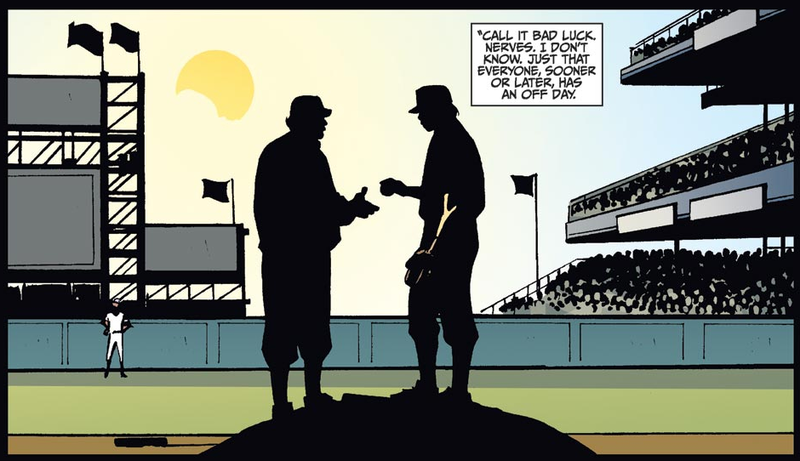 The collector, not the agent, fills us in on the ballplayer, who’s name we never learn but who the collector refers to as a “slob”. He’s a lefty long-reliever/back-of-rotation starter who is a has-been, only able to stay in the league because of a rubber arm and his left-handedness. At one point, we are told, he sold out his teammates to a gossip magazine and unveiled their various infidelities and wild parties, and since then he’s been poison, bouncing around from team to team simply because his inning-eating ability is too good to be passed up. And yet, one time, somebody offered him a ton of money to throw a ballgame. Except, not only did the slob not throw the game, he threw a no-hitter. Needless to say, those bookies now want the slob dead. I need to applaud Bullseye for growing facial hair that fits the role. But there is a point being made here: Bullseye could just find the “slob” and shoot or stab him, but, no, he’s going to do this the hard way. He wants to kill him at the plate (thankfully, it is later noted, the “slob” generally plays on NL teams)…. no matter how long that might take. 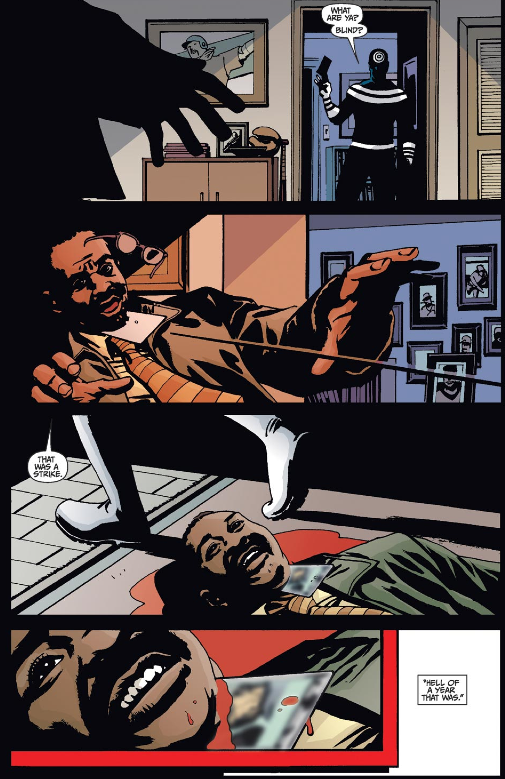 And as the second issue shows, Bullseye knows this and is willing do whatever it takes to do this. The first issue was set-up. 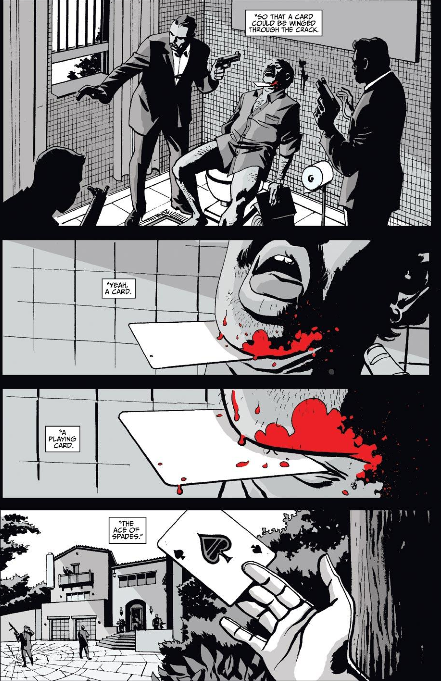 The second issue is also a lot of set-up, but it’s also the execution as well. “Matt Hobson”. Something to note here is that the first name is also something of a joke, although the collector doesn’t recognize it. And, what’s more, he needs a hitter to practice throwing against. After all, it could be awhile before he actually faces the guy he needs to kill, so he’s gotta be good enough to make the majors in the first place. 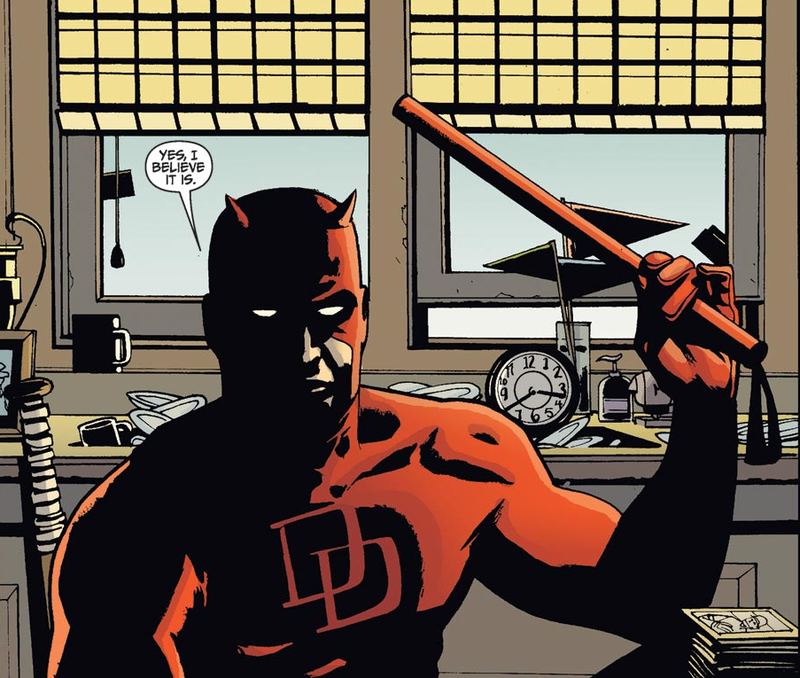 So, he calls in somebody to face as he practices: the Taskmaster. This is a rather brilliant move on Huston’s part (and Bullseye’s). 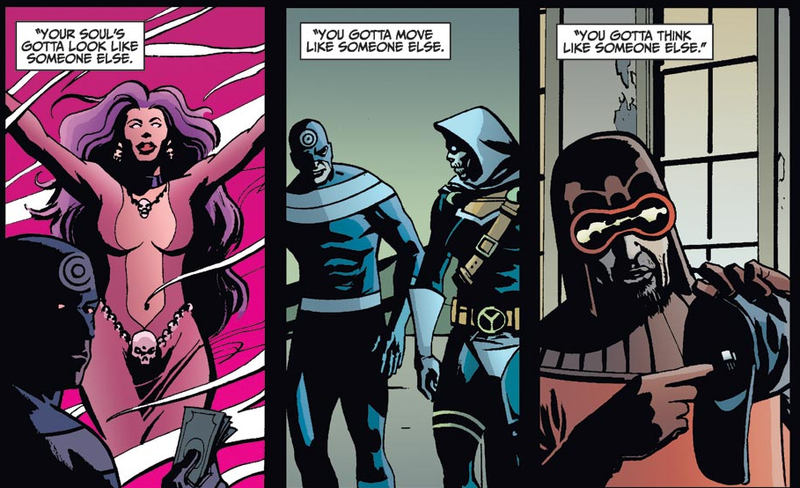 Taskmaster is a Marvel villain/antihero who is able to perfectly imitate the physical actions and skills of anybody he sees, so by having him as the guy he is pitching against, Bullseye can basically pitch against any hitter in the majors. A nice touch. 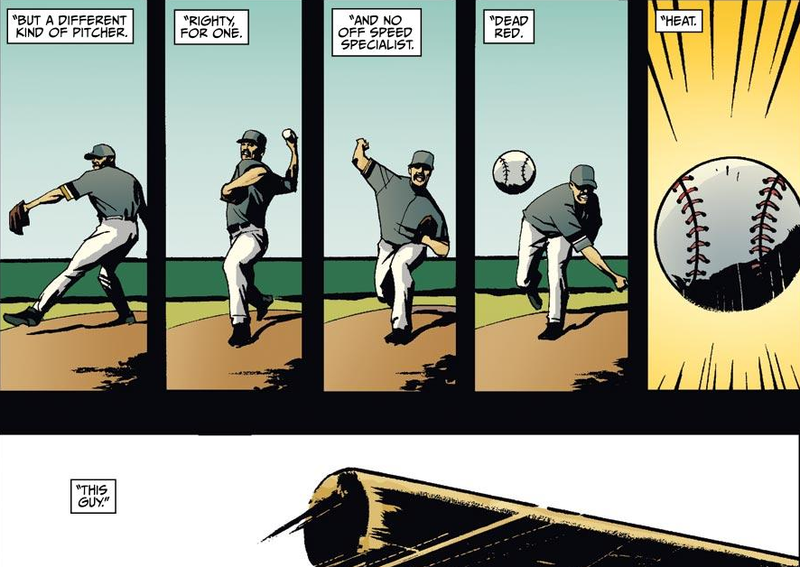 Although it does bring up the question of why Taskmaster just doesn’t copy a Major Leaguer’s swing and go make himself a multimillionaire. 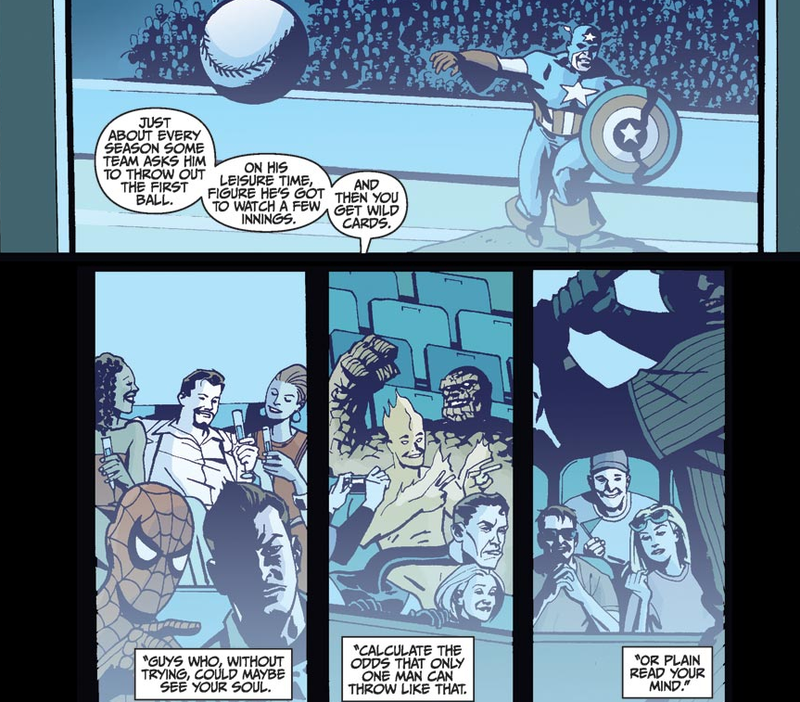 Oh, Tony Stark, of course you’d bring two supermodels to the ballpark with you. You dog. And, wait, what about the fact that there are heroes who can see through souls or read minds? We’ve already met Taskmaster last issue, and according to the internet, the other two he contacts are Umar (the sorceress, a foe of Doctor Strange) and Mentallo (the guy of the right, a foe of SHIELD). Ah, yes, poor Bullseye ends up stuck behind a rotation with good depth. Not his fault, really, after all, to go and kill this “slob” he’ll need to play in the NL, and only one team was going to take him. 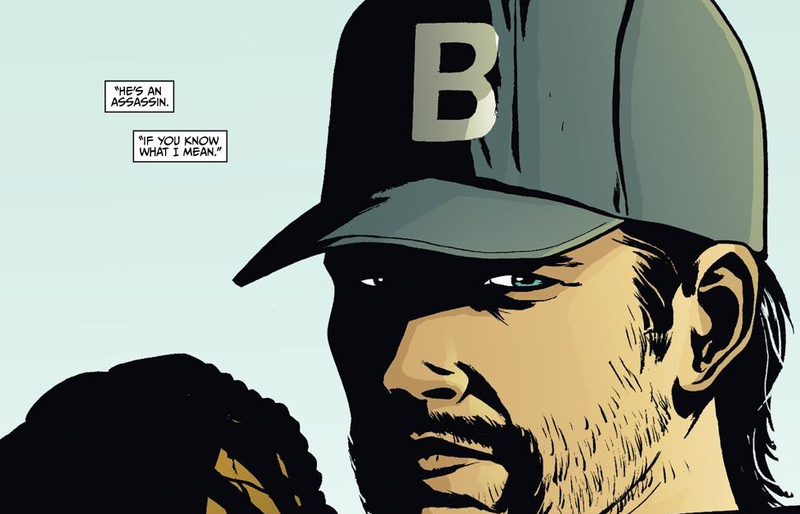 But, hey, this is Bullseye, he’s a mean, psychotic SOB who’s killed at least two of Daredevil’s girlfriends and once murdered his way through a church full of nuns in an effort to try and kill a baby. He’s playing a year of professional baseball just so that he has the chance to kill a guy at the plate. You think being down in the depth chart is going to stop him? Oh, and then, Bullseye sees to it that the prospect called up to replace the ace after his surgery is hit in the noggin by a battery in Philadelphia. And then, it’s Bullseye time, and on August 28, it looks like Bullseye will get a shot at the slob. Except, one problem: Bullseye gets shelled and is on the bench before he has the chance to kill the slob. But, of course, a few “freak” injuries later, and Bullseye is set to meet the slob again. Except there is one problem: Bullseye doesn’t kill him. At least, not initially. Not in the third inning when the slob comes up, because, well, Bullseye has been on a hot streak and wants to see how far he can go…. and he remains perfect. 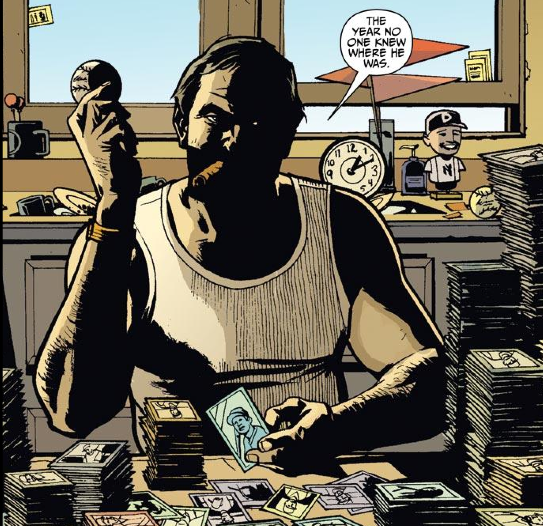 So, Bullseye gambles, not just on himself, but on the slob. Bullseye wants to make that story reality, because nothing, perhaps, could be be greater than that. Not even his previous “high”. Now, needless to say, with two pitchers perfect after six innings, it starts to become the talk of the sports world. 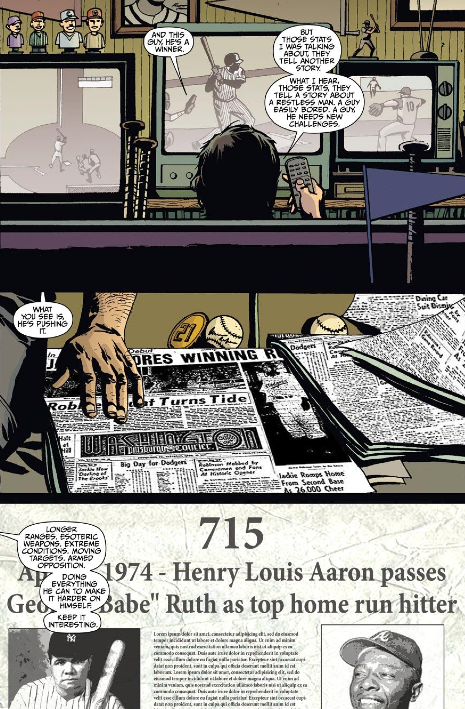 The above are, going counter-clockwise, the Avengers (Spider-Man and Wolverine were members at the time, and, no, I don’t know how they got those random pennants), the X-Men (with the Beast making a hilarious face), and Matthew Murdock AKA Daredevil (listening on the radio while reading braille). It’s a nice touch having the question about whether anybody has seen through his disguise be asked while focusing on a blind man who happens to know Bullseye the best. So, amazingly, both Bullseye and the slob stay perfect, and it’s the bottom of the 9th. 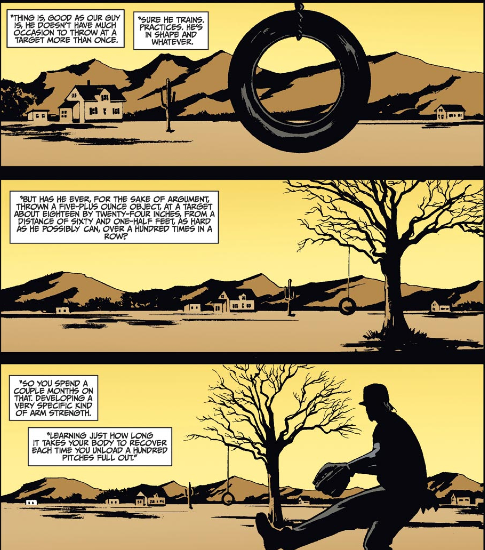 Now, this in itself is amazing, even for a comic book work of fiction. 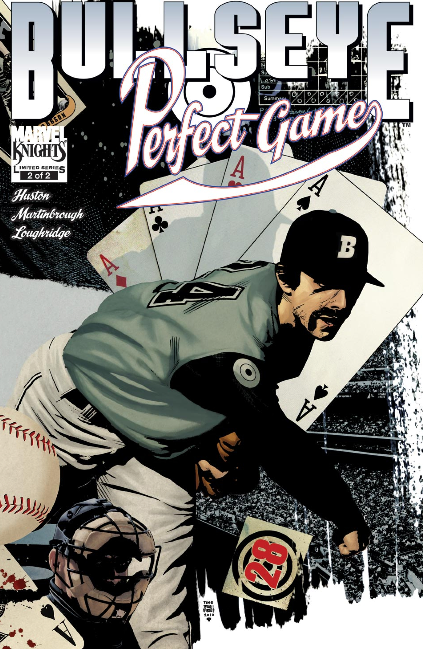 The longest “double-perfect” game in history, as far as I know, was the Dennis Martinez perfect game, where Mike Morgan was also perfect until Ron Hassey started the 6th inning with a single. The longest “double-no-hitter” game in history was May 2, 1917, when Fred Toney and Hippo Vaughn had no-hitters after 9 before the Reds finally broke through against Vaughn in the 10th. The umpire. 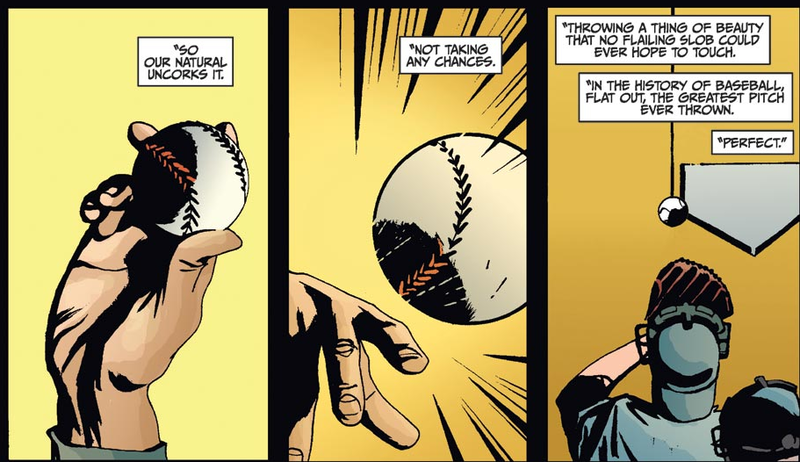 No more perfect game, and Bullseye decides to just end it, giving the next batter a fat pitch that he pummels for a walk-off HR. And that’s that. Bullseye was looking for the perfect kill, the perfect high, and instead got so interested in another type of perfection that he ended up with no perfection at all. 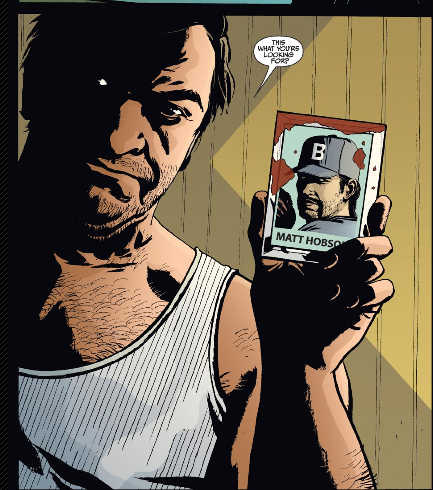 He disappears into the ether, and nobody is supposed to ever know that he was Matt Hobson. Except, hang on, why is the collector talking to us? How does he know Bullseye was Hobson? Who is us anyway? So… who is looking for that piece of evidence masquerading as memorabilia? If you guessed “a man more blind than the umpire,” well… Bullseye. 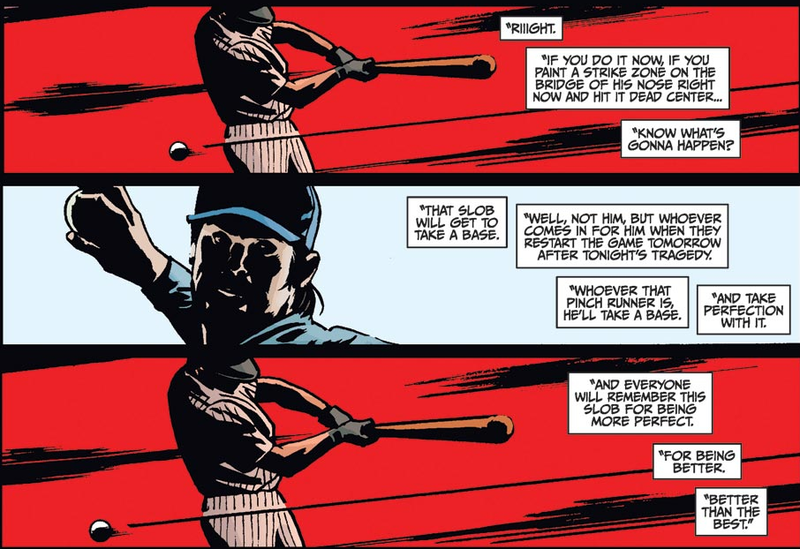 NEXT TIME ON BIZARRE BASEBALL CULTURE: More Marvel. 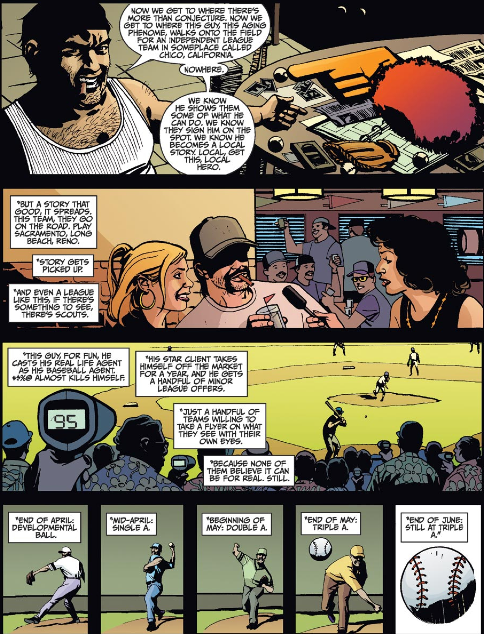 This entry was posted in Baseball, Books and all their spinoffs, Non-Baseball, Uncategorized and tagged baseball, baseball comic, baseball comic book, Bizarre Baseball Culture, Bullseye, Bullseye Baseball, Bullseye Perfect Game, Charlie Huston, comic, comic book, Daredevil, Marvel, Marvel Comics, Perfect Game, supervillain, weird baseball by danglickman. Bookmark the permalink.